An amazing iOs app sale is underway from Touchpress, publisher of expensive, deep, highly-creative educational apps for iPhone and iPad (I think they all work best on iPad). I haven't seen mention of the sale anywhere, and I don't know when it ends, but after several years of waiting for price drops (I "wish-list" apps at Appshopper.com, and they email when prices go down), this is by far the lowest they've ever gone. Beware that the apps, brimming with multimedia, tend to be huge. You may want to buy on your computer and then load them one at a time if your device is short on space. Note that Appshopper (where the following links land) hasn't updated all pages to current sale prices; click through to iTunes (by hitting the "buy" link; no purchase obligation) to see the discount price. Also, these links should go to Universal or iPad versions. If you want iPhone versions, you're on your own. For convenience, here's a link, which opens directly into iTunes, of all Touchpress' apps. I just posted a comment to Quora in a discussion about psychics. The question asked "What would be the greatest question to ask a psychic to prove that they're a real psychic? ", and someone replied that psychics are unable to guess his favorite 22 digit number. The problem is that the number isn't stored in your mind, it's stored in memory. Mind isn't a ticker tape of one's memories and other mental contents. That stuff isn't in RAM. The non-verbal issues and emotions currently occupying someone's RAM can be gleaned via intuition. And intuition isn't magic; any of us can determine, to more/less extent, what someone's thinking via context, body english, facial expression, previous experience with the person, etc.. And some people are way better at this. For any given human faculty, there are edge cases whose special abilities appear near-magical. Intuition is no exception. But pulling data from the neural structures of someone's memory isn't a human faculty, so you won't find anyone particularly good at it. My friend, guitarist and cooking enthusiast Dave Mitchell recommends a TV series called "A Bite of China" from Chinese television. "I am in the process of watching all the episodes. I really like it. It has subtitles in English translated by a Chinese translator so it's all wrong at times but you can understand what they are talking about. A great look into real life and the way the Chinese cook and think about food." Here's episode one, on a page containing links to the subsequent episodes. You can also view the series for free via Amazon Prime Video (I'm not sure if the subtitles there are any better) or buy the DVD for $10 here (you'll need an all-region DVD player - or see whether you can hack your current player by googling the model number along with "all-region"). I was unusually savvy for a young jazz trombonist/food writer. Creative people are frequently exploited, but I was having none of it. I refused to sign onerous contracts, and backed out of jobs at the first sign of ill-treatment. I turned down more gigs on principle than most people ever apply for. I'd love to say that the music and writing gigs I stuck with were ones where I was well-treated, but they were just as bad. It's just that, for some reason, I never quite got around to storming out of them. I was often paid a pittance, disrespected, and denied most basic human courtesies, all for crappy enterprises with which I felt queasy to be associated. And, again, these were the ones I'd stuck with. The crème de la crème! But thanks to those ventures, I managed to built at least something of a name for myself in my two fields. The crappy free newspaper I started out with, where I was edited by a back-stabbing clown and paid practically nothing, was read by a few million people. I suspect a sizable number of Slog readers first read me there and have stuck around. These are also the people who seeded Chowhound. Same in music, though I never had my breakthrough "BoneHound" equivalent. Playing with crappy bands in crappy venues for crappy money got me heard, and I gradually built a reputation. With a reputation, there are possibilities! Friends of mine took this to an extreme. Larry Goldings and Peter Bernstein played for free (for free!) at an unfriendly pub on the upper west side several nights per week for years. The surly owner openly mocked other bar owners for paying musicians, bragging about how he had top talent working for free (he treated them, needless to say, like crap, too). Both are now stars, and they can trace it all back to their time at Mr. Surly's nightmare bar. I keep stressing this to young people (and to older people attempting to switch careers): be exploited! It's a natural part of the process. The only way to ensure an immaculate record of non-exploitation and unblemished dignity is to do absolutely nothing with your life. Now I view it from the other side, as I find myself recruiting people for my own schemes and projects. Many can't help but set their jaws and strike an adversarial posture. They assume, against all evidence, that I'm a sharpie aiming to squeeze them dry (it got a lot worse after The Social Contract came out, and people learned that us curly-haired, silver-tongued idealistic visionary entrepreneurs are always out to screw you*). The more easy generosity I display, the more they suspect a Big Fix beyond the facade. There were two people, in particular, who I spotted and immediately appreciated. I brewed up cool projects to work on with each of them, to help them escape brutish dead-end jobs. But while they loved my ideas (I've got to admit; they were pretty good), and genuinely liked me, both got their backs up and dove into pugnacious negotiation at a point where eagerly gleeful dreaming should have been happening. I haven't spoken to either in several years. I know neither's doing much. But, hey, at least they avoided being exploited. * - This absolutely says it all: The Social Network's tragic exploited victim Eduardo Saverin, who appears to have been little more than a hapless drag on Facebook's early operation, is worth $5 billion. That's a better position than can likely be achieved by astutely side-stepping traps. Question: My question has to do with how we classify these objects. Since Pluto and Charon orbit a shared point/barycenter in space, is it finally time to stop calling the latter a moon? 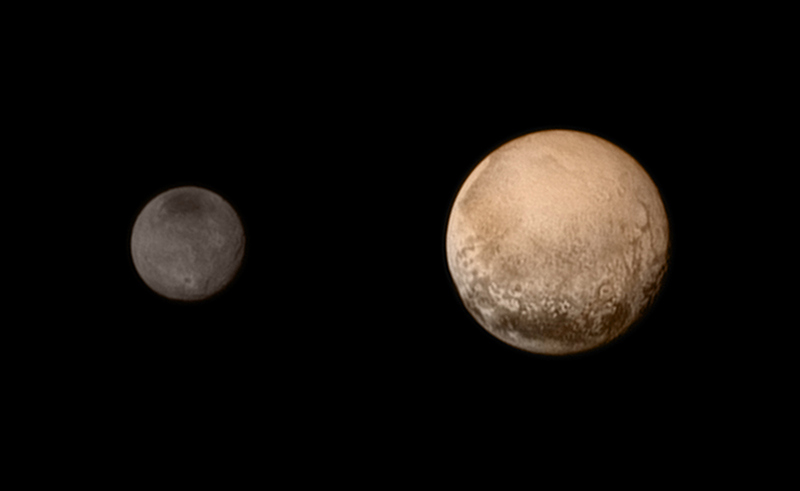 Thanks to all of you, it seems to me that we have our first up-close, composite photograph of a binary dwarf planet! ...and if we continue with that line of thought, aren't Styx, Nix, Kerberos, and Hydra really scattered Kuiper Belt debris that fell into orbit around Pluto's system, as opposed to traditional moons? Comment: Thank you for reminding me of something Richard Feynman once said: “You can know the name of that bird in all the languages of the world, but when you’re finished, you’ll know absolutely nothing whatever about the bird. You’ll only know about humans in different places, and what they call the bird. So let’s look at the bird and see what it’s doing—that’s what counts. I learned very early the difference between knowing the name of something and knowing something." It's not just the naming. It's the whole abstract ball of wax of how we classify and weigh and color and conceptualize and dramatize things, including ourselves and each other. Just as it couldn't matter less how we categorize Pluto and Charon, Meryl Streep didn't become a more important actress when she won her first Oscar. Things are what they are, and the rest is insubstantial mental annotation...something we humans indulge in for fun yet inevitably take way, way, way too seriously (the downside of the marvelous human faculty of pretending is the inevitable burn-in as we quickly forget not to take it seriously). We mistake it for reality, and need to be reminded via insightful quotes from lauded geniuses that the real is the real, and the rest is annotation. Is that really such a leap? This is what I meant in the previous posting when I said "Nothing - absolutely nothing - goes on your permanent record." The record is an abstraction. There's no record. There's just you, now, period. Infinitely free. You're only a crusted agglomeration of past horrors and missteps if you live in an abstract story. But we live in reality, not storyland. We are not our own annotations! Yet we spend our lives pretending to live more in abstraction than in reality (that's why time speeds up as we age). And we make ourselves miserable with the stories we tell ourselves about what's happening (consider my favorite book title: "What's Wrong with Right Now...Unless You Think About It?"). At some point, we each have chosen a certain happiness level, and thereafter habitually tilt our perspective of our daily lives to constrain happiness to that threshold. That's just one way in which we imprison ourselves within our own abstractions. Eventually, the self-imposed restraints grow so tight that only feats of heroic resilience can wrench us free of our abstract notions of how badly things are going at any particular point. But it's only quasi-struggle, taking place entirely in abstract Storyland - the realm where it truly matters what you call a dwarf planet (or a tall actress)! - rather than in reality. Our "problems" are almost entirely in the abstract, they're almost never actual problems. And the habit of indulging the compulsion to tell ourselves dark stories about our abstract quasi-problems is the root of much depression. I made myself needlessly miserable one Christmas eve, bouncing between the actuality of a perfectly nice evening and the abstracted notion of how Christmas Eve really ought to go. My reality was cozy and happy, but happy reality couldn't measure up to a hypnotized obsession with abstract constructs. There is, however, a benefit to pretending to live in a jumble of stories about the world rather than in the world itself. Since the stories are completely and ditzily arbitrary, it's surprisingly easy to change one's experience by flipping the story. If you hunt down the links, above, you'll see me approaching this same issue from myriad angles over the course of many years. Whether you're an engineer trying to learn about Pluto or a seeker trying to learn about yourself, the very first step is to shake loose the unreal - that which is mere mental overlay. Also: there's nothing wrong with pretending we're in a story. Stories are fun! That's why we enjoy movies! But when we lose ourselves in the story, we can fool ourselves into thinking we're miserable (taking our pretending too seriously is humanity's signature flaw). The trick is to enjoy the movie with some amused detachment - especially if we find ourselves screaming at the scary parts. Nothing - absolutely nothing - goes on your permanent record. Maturity is the correction of the misconception that you're the protagonist in this drama. You're not. You've never been. You're a character actor, briefly adding your bit of unique color to the action. The evidence which accumulates to prove this only feels harrowing for those who insist on clinging to the misconception. I enjoy the blog of (and the postings on Serious Eats by) Shao Z, who mostly covers Chinese cookery. She's never written about restaurants in her native Philly, but offered to create a tip sheet. When she does, I'll link to it. But, meanwhile, as barter, here are my own Philly tips. Nothing's in any particular order (aside from loosely organized geography). Khyber Pass 56 S 2nd St. Great beer bar with storied and colorful history. It's on an upswing, both beer-wise, and food-wise. Kitchen used to be a little tired, but at least for the moment they're cooking up a storm. Pete’s Pizza Joint 215 Chestnut St - my current favorite slice pizza. Paesano's Philly Style sandwiches 1017 S9th ST. Inauthentic but delicious panelle, etc. This is like a gastronomic "telephone game"; genuine Sicilian sandwiches filtered down through generations to the point where it's barely Sicilian anymore, but has a literally Italian-American deliciousness. Get anything with fresh mozzarella, which is awesome here (I need to figure out where they source it). Monsu 901 Christian St; (215) 440-0495. Fancy sit-down Sicilian with same owner as Paesano's. High up on my check-out list. Unknown Cantonese: I had a very good Cantonese meal at 2am somewhere in Chinatown, but, uncharacteristically, failed to pick up a business card. I had to ask for the good stuff (flowering chives and other special vegetables, foo-yee/foo-roo sauce, etc), it's not on the menu. Update: I think this was Shiao Lan Kung (930 Race St). Glick's Salads potato chips are repackaged red-bag Good's chips (a serious find for fans of PA Dutch lard-fried potato chips). Dienner's Bar-B-Q for fantastic rotisserie chicken. Wings are stunning—bones shatter easily, yet the meat is consummately moist. Stateside 1536 E Passyunk Ave 215-551-2500 Pleasant place for oysters, beer, cheese, tartare, bites. you can hang over the sidewalk on cool swinging wooden chairs. Hardena indonesian: 1754 Hicks St (1 block w of S. 15th) at Moore. 215-271-9442. Closed Tuesdays! This is the best Indonesian I know; I've followed this chef for 25 years, and make special trips to Philly to eat here. Sky Cafe Indonesian 1540 W Ritner st (215) 271-1983. closed thursdays. I've heard this is as good as Hardena, but I haven't tried it..
Viet Tofu 1110 Washington Ave 215-339-0388). They've changed names; hope it's not new management. The following are notes for up to last year. They make their own very good tofu and Vietnamese bakery items. Great fried stuff (don't miss the impulse buys near the cash register). Get green soy milk, made from fresh soybeans (not from fridge; order it at counter). also steam tables w/prepared Vietnamese tofu dishes. I was here for their grand opening; more info here. Pho 75 (1122 Washington Avenue;, 215-271-5866) branch of the famous Pho 75 of northern Virginia. In the same shopping complex, Hung Vuong (215-336-2803), a large Asian supermarket, has a barbecue meat counter selling very tasty (and reasonably priced) ready-to-eat ribs and other meats. Ratchada Thai & Laos Cuisine (1117 South 11th St; 215-467-1546) Laotian! A rare cuisine! I tried under its former name, Cafe de Laos, and was good-not-great, but reasonably authentic. Philadelphia is light years ahead of NYC when it comes to craft beer. Here are some lesser-known places to enjoy them (I never patronize the bigger, more famous craft beer bars in any city; they're always arrogant and unpleasant). 12 Steps Down 831 Christian St 215-238-0379 Quentin Tarantino-style basement bar. Some good and unusual beers. Revolution House 200 Market St 215-625-4566 the guy who chooses the beers has incredible taste, but he's off-premises and the staff is absolutely clueless. Nice rooftop area. The Irish Pol 114 Market St 267-761-9532. Was a well-known dive bar for great beer. They relocated, it's super shiny, but bartenders are super great, beer well-chosen and well-priced. Varga Bar: 941 Spruce St (215) 627-5200. sleek gastro pub with outdoor seating. Mobbed at prime time, but pleasant early and late. Coffee Bar @Warwick Hotel 1701 Locust St (215) 789-6136. My find-iest find. This is the coffee shop of the Warwick Hotel, it closes early, and it has just two beers on tap - mini-kegs served from little refrigerated picnic set-ups. But they're beautifully chosen, and the bored counter guy (can't call him a bartender) really knows his beer. Also, weirdly great cookies and other go-with-coffee pastries. There's a full bar across the lobby that, so far as I know, has never served a great beer. Doobie's 2201 Lombard St (215) 546-0316 ‎old fashioned place. Local 44 4333 Spruce Street (215) 222-2337. Good gastro pub. Bottle shop next door is absolutely primo, with great selection, super knowledgable clerk (prices a bit high, but worth it). South Philadelphia Tap Room 1509 Mifflin St (215) 271-7787 a quick walk from Hardena. E Mei Szechuan 915 Arch St (215) 627-2500 sliced pork with crispy rice cake. Caribbean Delight 1124 south st 215-829-1030 looked great. closed mondays. George's Sandwich Shop 900 South 9th St at Christian 592-8363 tues-fri 9 am-8; sat 9 am- 5; sun 9 am- 2pm; CLOSED MON roast pork, beef, veal, and tripe sandwiches. Also Cheesesteaks There are 2 George's; find the one on your right when walking north from Washington ave. Order w/ sharp provolone. BaoBaoHao Chinese Seafood. They seem to move around a bit; last known location was 1004 Race St. At one point, it was a strange amalgamation of classical Chinese cooking plus Southeast Asian dishes. I'd like to crack the mystery. Taqueria La Veracruzana (908 Washington Ave; 215-465-1440) Looks excellent. Alla Spina 1410 Mt Vernon (215) 600-0017. Only had some (delicious) tastes of things when they first opened, but a super handsome space run by really committed, friendly people. I've been meaning to update.